My mother and father had separately fled from China in the mid-20th Century. They met in New York City, both exiles from war, revolution and chaos. My father believed that if he returned to China, he’d be arrested, persecuted, even killed because of his strong opinions about its government. My mother had also fled China, escaping from Shanghai in May 1949 with her sister’s family, just before the Communists marched in to that cosmopolitan city.But refugees and asylum seekers anywhere are rarely welcomed, then or now. 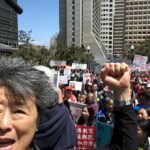 The Chinese arriving in the U.S. in the Cold War McCarthy era were not greeted with the same suspicion and hostility that had driven the internment of Japanese Americans and the decades of exclusion and ethnic cleansing of “Orientals” and “Asiatics.” The Chinese who fled the Communist revolution were treated as potential enemies in the U.S. The Immigration and Naturalization Service (INS), like ICE today, was always on the hunt for “illegal aliens” and when they found my mother, she was immediately threatened with deportation. In those days, my mother spoke limited English, so my father went to the deportation hearings to assist in her defense. Because she was the mother of three American born citizens, they decided not to deport her because of the harm that separation would inflict on her American-born, U.S. citizen children. That was during the hysteria of McCarthyism. Today, under tweeted histrionics, the US government shows utterly no regard or compassion for families and children. Under today’s regime, my siblings and I would have been separated from our mother and sent to an ICE children’s detention center–or we might have all been deported. Because of the revolution in China, my father had also overstayed his visa to the U.S. but had managed to stay under the INS radar. When he assisted my mother at her deportation hearings, he came under INS scrutiny and was arrested. He, too, endured detention and deportation hearings and might have been deported to Taiwan, where he had never been. However, in those McCarthy years the INS ruled that he could stay, because my mother and three American citizen children were entirely dependent upon him for support and would have become a burden to the U.S. government. The INS also determined that deporting my father and separating our family would cause terrible harm to the three children. Once again, today’s government would have heartlessly separated us. In my latest book, Last Boat out of Shanghai, I describe family separations that took place seven decades ago, when millions of people were forced to migrate as refugees from crisis in order to survive. I’ve interviewed many people, now in their eighties and older, who experienced the trauma of forced separation when they were children. Even at their advanced age, they suffer from the trauma and harm of separation. As one of them told me, Today’s children are suffering from wounds that will never heal, and it is inevitable that this trauma will spill over to the rest of society. All decent people must stand against the cruel and unusual punishment waged against immigrants by this terrible regime. 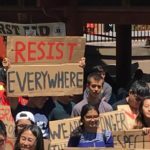 The deportations and separations must end–resist!